Stumbling Into Grace by Lisa Harper is a collection of stories from Lisa’s life, which takes readers on a journey about faith and the misconceptions we often have about Christ. Lisa has a delightful way of meshing humor with her personal stories that relate to Biblical truths. I love that Lisa’s stories were relevant and allows readers to connect on a deeper level. I think most of us have had similar fears, doubts, shame, misconceptions as Lisa. Her candidness allows others to see that they do not have to be overtaken by their guilt, shame, past mistakes, etc., but their lives can be transformed into a life full of joy that is ultimately centered around their relationship with Christ. This would be a great gift for someone who feels that they aren’t good enough for Christ’s love or struggling with the theological truths presented in the Bible. Relationships are complicated, especially when it comes to dating and marriage. Renee Fisher is the author of Faithbook of Jesus: Connecting with Jesus Daily and new release Not Another Dating Book: A Devotional Guide to All Your Relationships. Renee has a passion for 20 somethings and knows first hand about trying to pursue God and living a life that honors Him while waiting for His promises to be fulfilled in her life. Her new release Not Another Dating Book takes relationships to a whole other level… a Christ-centered level. Not Another Dating Book is packed with short devotions that are not only filled with scriptural knowledge about dating/relationships, but Renee’s honesty and truth about her own relationships allow readers to connect with this book on a personal level. I love that she is not afraid to discuss the difficult relationship questions that so many young adults deal with on a daily basis. One of my favorite parts of this book is that Renee includes a prayer at the end of each devotion and extra scripture reading with a place to journal your thoughts. God designed us to be in community with one another so whether you are dating, married or just friends, this book is sure to make an impact on how you view the relationships in your life. *I received a copy of this book for review, but the opinions stated above are my own. Have you lost your blogging mojo, or maybe you’re like me, and never had it, but wish you did? Then, 31 Days to Finding Your Blogging Mojo is just the book for you. Bryan Allain combines humor with knowledge that will help you get your mojo back on like Donkey Kong. What is that you said? You can’t possibly find an opening in your schedule to read some self-help book about blogging. No worries, it’s only 101 pages long, and part of that is the table of contents. Plus, you can read at your own pace… 31 seconds for all you speed readers out there or 31 days for the rest of us. At the end of each chapter you’ll find Today’s Mojo Action, which helps you put the knowledge that your brain just soaked up to the test. I’m not sure my review can give justice to all of the awesomeness and humor that Bryan has packed into this book so check it out. You, your blog readers and your momma will thank you. Get the pdf version here or the Kindle Edition here. *Disclaimer – I received a free pdf of 31 Days to Finding Your Blogging Mojo to review, but it in no way, shape or form forced the outcome of my thoughts and opinions above. Fresh-Brewed Life by Nicole Johnson is an invitation to wake up your soul in 3 major area of our lives. First to God, then to yourself and lastly to others. This book shows us areas of our lives we are sound asleep, and wakes us up from that deep dark slumber. Nicole shares her journey of living a fresh-brewed life and gives insight on how other women can have that same fullness in their lives. This book is great for your morning time coffee/tea and devotions. It has a study-guide in the back which is great, especially if you are wanting to make this into a small group study for women. Each chapter has a journal assignment which allows you to think about the topic in that chapter and really get to the heart and soul of living a fresh-brewed life. The journaling takes you out of comfort zone and on an adventure to revive you. This book would be a great gift for any woman who wants to dive deeper into their their relationship with God, themselves and others. This could be a great mother’s day, birthday or thinking of you gift for a special lady in your life that needs a little inspiration to wake up her soul. I highly recommend it. “Couples Who Pray: The Most Intimate Act Between A Man and A Woman” by Squire Rushnell and Louise Duart shares how prayer brings couples closer together, especially intimately and physically. This book challenges couples to pray together for at least 5 minutes a day for 40 days. It shows examples of ordinary and celebrity couples who have tried this and have been successful at praying together. The concept of the book, which is praying together, is a much needed in marriages, but this book seemed to be more of an advertisement to get what you want by praying. It left me a little skeptical of their goal. I believe every couple should pray together, but this book made it seem like if you pray together then your marriage would be fine. 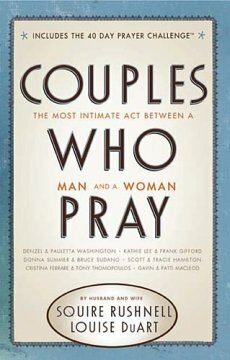 Many celebrity couples who pray together are used as examples in this book, but many of their accounts seem unrealistic. I felt like they focused more on the wealth and “physical” intimacy they gained than on how it brought them closer to God and each other. Again, I think the concept is right on, but it fell a little short. 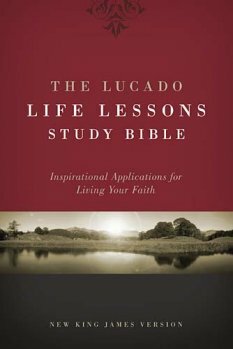 The Lucado Life Lessons Study Bible, NKJV Inspirational Applications for Living Your Faith by Max Lucado is exactly what the title implies. It is a Study Bible that gives practical advice about life lessons as it relates to scripture through the use of devotionals, which are written in the sidebars. Also, this Bible uses Christ Through the Bible sidebars that go along with the scripture reading for that day. What I like about this Study Bible is that it not only gives us side notes about the passage, but it also shares life lessons through devotions. I really like that it gives a brief blurb about each book and who wrote it so that you can have an idea of the historical time line and setting. This Bible uses the NKJV, which is an understandable version, and the hardcover seems very durable. I believe this would make a great gift for those wanting to delve deeper into the Scriptures and learn how they relate to us today. One criticism that I have though is that the typeface seems a little small and very scrunched together. I would still recommend this Bible to others, especially for gifting purposes. Recently, I started going to Zumba at my local community center with my friend. If you’ve never been and wonder what it’s like, it’s really, really intense dance-type exercise to latin/pop music or Musica Urbana, which I now listen to at home when I need cheering up. In my opinion, it is UH-Mazing! My instructor mentioned that doing Zumba for 3 hours burns about 1500 calories. Whew, now that’s a workout! That’s like a whole days worth of calories! One of my goals for 2011 is to lose 10 lbs so that’s gonna be a whole lot of zu Zu Zumba-ing. Oh, and did I mention that I have two left feet so I may just improve my rhythmically challenged self in the process. *Funny side story – I once slept-sang (not an actual word) in my sleep. I went to Zumba one night, and afterward, I went home and fell asleep. Bill came running in the bedroom because he heard me loudly singing some Enrique Iglesias song that I had just Zumba’d to. Did I mention I was asleep while all of this was going on?! Hence the made up word slept-sang sort of like slept-walked, but instead of walking in my sleep, I was obnoxiously singing in my sleep.